We went for a bicycle ride down to the harbour last weekend. Here's Wifealiciousness on her Velorbis Scrap Deluxe outside the near Royal Theatre. 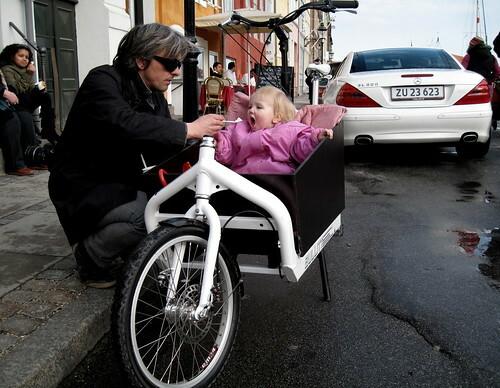 Yours truly feeding Lulu-Sophia - in our new Bullitt from Larry vs. Harry - some Sunday ice cream in Nyhavn. I just ordered a brand new Centurion Basic 7-gear last week. I've been cycling for many years, but only for exercising - yes, I'm one of the dreaded Lycra-clads ;-). Anyway, after following your blog for some time, it has become more and more clear to me, that I must have a bike for my daily transportation needs around Copenhagen. And after another stressful day of crammed busses and metro trains, I had enough, and raced to one of the local cycling shops and ordered a new bike! I will pick it up on Tuesday, and I just can't wait. 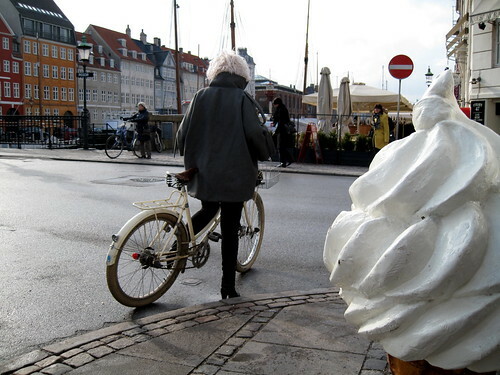 Can't wait to be a part of the morning bike traffic and to rediscover Copenhagen by bike. Just cycling around the city for no special purpose. And I can't wait to feel free like only a bike can make you feel free. It's a long time since I have used a bike for daily purposes, but now it feels so right, and I should have done this several years ago. 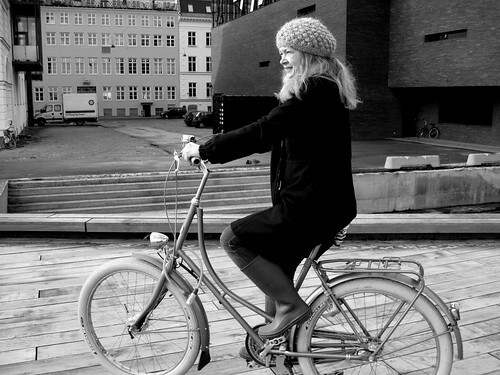 Eventhough I'm living in Copenhagen and I'm experiencing the Danish bike culture every day, it's your brilliant blog, which made me realize that I need a bike again. Thanks a lot! Sorry to see your classic Long John being dismissed. :-( It truly has more style than the Bullitt. Just curious - how do you pronounce "Nyhavn"? I'm wondering if it's like "New Haven", the city in Connecticut USA. Of course I'm sure New Haven isn't anything like Nyhavn! That bike is incredible. Very functional. I would love to have one for full sized me and then hire my friends to tote me around. BRILLIANT! I love these pics of your family riding around together! You all are so beautiful and very inspirational! oh my dear, what a lovely girl!!! its soooooooo cute! thanks so much for that amazing comment, jacob. truly humbling.